HARDIN COUNTY — Ohio State University Extension is asking farmers in the Maumee River Basin to help with a water monitoring research project looking at Dissolved Reactive Phosphorus (DRP) losses from fields. 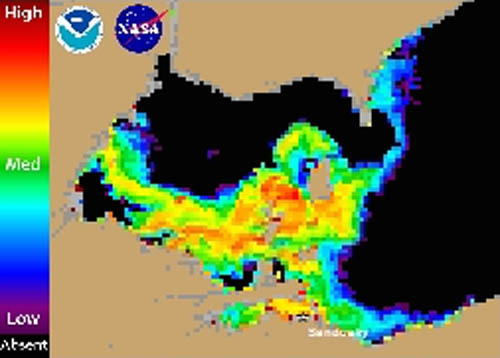 Increases in DRP in the watershed have been tied to increased occurrences of Harmful Algal Blooms in Lake Erie. The data collected will help better quantify actual losses from an economic and environmental standpoint, leading to tools that can target high risk fields so cost effective Best Management Practices can be designed that maintain crop productivity while reducing phosphorus losses. This project gives a farmer the chance to find out how much Dissolved Reactive Phosphorus (DRP) in pounds per acre is leaving their field site, based on their crop production system. Farmers will be provided their individual data plus summary data for all sites in the project. The data will be used to understand what conditions lead to DRP loss and what recommended Best Management Practices (BMPs) can be used to reduce nutrient loss. A plastic water sampling disk is placed at the end of field tile or within drainage water management structures during two periods of the year, September to December and March to June. The sample devices are changed out every four to five weeks during each sample period. A standard soil test analysis will be provided as well. There is no cost to the farmer for the water or soil sampling. The primary field selection recommendation is that drainage water sampled should only include water from the farm practices being done by the cooperating farmer. Shared field mains that include multiple farmer managements, road drainage, household water drainage or other areas not under control of the farmer should not be used. The field main should drain five or more acres. There is no upper limit to field size as long as the drainage area is known and the field area drained is under the control of the cooperating farmer. The end of the field main tile or a drainage control structure on the main tile should be accessible for deploying samplers. Field Management information by date for tillage, fertilizer applications and crop cover planting that occur in the three months prior to sampling through when the last sampler is pulled out will be collected. This data is extremely valuable to understand how practices influence the water quality results. More details on the sampling project as well as a signup link can be found at http://go.osu.edu/farmerwaterproject or contact Mark Badertscher, Hardin County Extension Educator, Agriculture and Natural Resources at badertscher.4@osu.edu or Greg LaBarge at labarge.1@osu.edu. Please sign-up by Sept. 1 to participate in the first sampling period.